International test cricket matches run five days and I always love watching the reaction of my US friends as they stagger in disbelief. I first played cricket at family xmas events which were always torrid affairs because one family of cousins, the Bennetts, were very gifted athletically and turned recreational cricket into something akin to professional cricket. Then there is Adelaide Oval. This is the home of cricket and always a joy to attend. Although, unlike my namesake, I have not umpired a game at Adelaide Oval, it would be quite an incredible experience. The luscious turf, even pitch, eclectic collection of stands, and the majestic St Peter’s cathedral imposing itself over the old scoreboard – it looks particularly awe-inspiring during day night matches. Most of my cricket umpiring has taken place in round robin and modified backyard cricket matches, where players pound the pitch, smash balls over fences, and rely on the honour system for adjudicating LBW decisions. 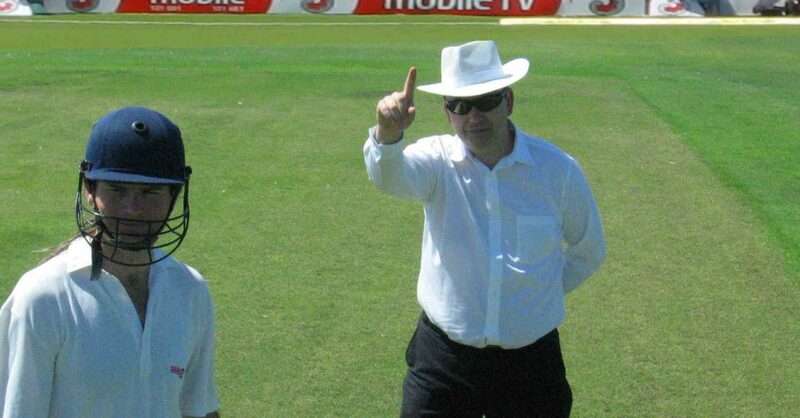 Probably the most iconic signal used by a cricket umpire is the raised index finger signifying that a batsmen is out. In the picture (admittedly a lark taken over the summer of 2010/2011) you can see me raising my finger to dismiss the batsmen while Symonds looks on from the non-striker’s end. Also, feel free to leave comments about your favourite cricket moments from Adelaide Oval. I would love to hear from you and might even bump into you one day. PS Some of my blood will be involved in international cricket I am sure. Keep your eye out for my nephew, Jamie Noll. He is impressing people in the various cricket comps around Adelaide and will be a strong contender for a baggy green one day (I confess I might be a little biased!). PPS You can find the Wikipedia entry for the other Steve Davis cricket umpire here. There are also stories about English Reserve Test Cricket Wicketkeeper, Steve Davies, who has announced he is gay. Sorry if you came here looking for him, try the Daily Mail.